New cafe and flower shop Bohaus is set to open on Marcus Garvey Boulevard near Halsey Street this June, according to the owner. BEDFORD-STUYVESANT — Stop by for a cold brew and stay for the bouquets. A new coffee and flower shop is slated to open its doors this summer on Marcus Garvey Boulevard, according to co-owner Jenn Hauser. Bohaus, which takes its title from a combination of Hauser’s last name and that of her business partner, Laura Bonnie, will sell coffee, pastries and blooming arrangements starting in June. The business at 406 Marcus Garvey Blvd., near Halsey Street, is set to have room for eight tables and bench seating that wraps around the front of 500-square-foot space, decorated with a chandelier, gold ceiling, floral wallpaper and vintage pieces. Hauser, who said she's been in the coffee business for the past 10 years and lived in Bedford-Stuyvesant, met Bonnie when they worked at Chelsea’s Martha Stewart Café. The two combined their passions for their new venture, she added, with Bonnie interested in floral designs. 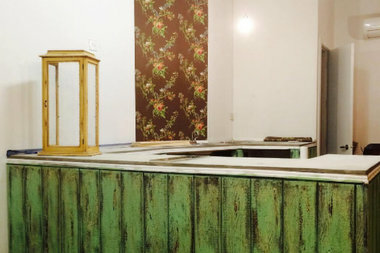 The café will serve Kobrick Coffee and three different cold brews. Flower arrangements will be set up for sale along one wall of the shop, and in the summer, the owners hope to host DIY events where customers can build their own bouquets. Bohaus is set to be open seven days a week from 7 a.m. to 7 p.m.